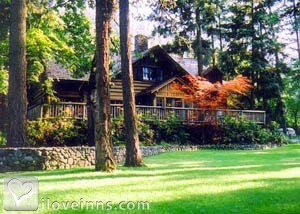 Ashland bed and breakfast travel guide for romantic, historic and adventure b&b's. Browse through the iLoveInns.com database of Ashland, Oregon bed and breakfasts and country inns to find detailed listings that include room rates, special deals and area activities. You can click on the 'check rates and availability' button to contact the innkeeper. A logging town once with just a single mill to boast, Ashland, is now one of the larger and more populated cities in the Oregon interior. It is also currently a cultural center of the state. Ashland is famous because it is a unique combination of outdoors fun and culture. From an Ashland bed and breakfast accommodation guests can enjoy wonderful outdoor adventures, such as rafting or kayaking at the Kokopelli River or fishing at any of the freshwater bodies in the area. Plan ahead for reservations at Ashland bed and breakfast inns in time for the Oregon Shakespeare Festival. The city of Ashland is also famous for its wines and there are several wineries tourists can also visit. Among these are the Weisinger's Vineyar and Winery and Paschal Winery. By Arden Forest Inn. Ashland Oregon is the jewel of Southern Oregon. Surrounded by nature with plenty of hiking, biking, skiing, fishing, rafting and outdoor adventure it is the ideal place to visit. Ashland is home to the Oregon Shakespeare Festival, we get over 1 million visitors a year coming just for the theatre. It is a town with wonderful shops, fantastic gourmet restaurants and over 70 vineyards making it like Disneyland for adults! Located on the I-5 Corridor, it's the perfect place to stop over on your way down from Washington to San Francisco or visa versa! Day trips to Crater Lake National Park and the Oregon Caves are easy to do. Ashland Bed and Breakfast inns provide both comfort and hospitality and the innkeepers are knowlegable about the area's vineyards and local activities. By Bayberry Inn. Ashland, Oregon has so much to offer. Home of the Oregon Shakespeare Festival, where you can see some fabulous plays by William Shakespeare and many other productions. If you love theatre, you can also enjoy a great musical production at the Oregon Cabaret Theatre in downtown Ashland. We are located thirty minutes to the Britt Festival which features some of the best musical performances, from classical music to rock concerts, they have it all. The venue is beautiful and you can bring your own picnic basket, wine and food and enjoy the music while sitting out on their beautiful lawn overlooking Jacksonville's mountain range. Located in the beautiful wine country, we have three great valleys with over 70 vineyards. What we love most about our wine country is that it's maintained it's small regional feeling and often you will meet the owner of the vineyard while he or she is pouring you your wine. Located where the Cascade and Siskiyou mountains meet, which provides great hiking and mountain biking trails. Almost every street 'above the boulevard' in Ashland has an entrance to a hiking/biking trail and you can ride throughout our mountains all the way to Mt. Ashland Ski Resort, which offers fantastic skiing and snowboarding. You can also access the Pacific Crest Trail, which is enjoyed by thousands of visitors each year. From great restaurants to fun local shops, Ashland is a lovely small town with a big heart! By Bayberry Inn. A delightful retreat tucked into a beautiful valley full of artists, galleries, theater and good eating, Ashland, Oregon is set in beautiful natural surroundings with lush parks, farms and wineries, a ski resort, nearby white water rafting, excellent hiking and running trails. By Ashland's Black Swan Inn. Within easy stroll from the inn are world-class theater, art galleries, parks, bookstores, boutiques and day spas. Expand your experience with short day trips by visiting Crater Lake, wineries, and Jacksonville. For those who love the outdoors or who want adventure, the Rogue Valley is a veritable four-season playground for rafting, kayaking, fishing, skiing, hiking, snowshoeing, snowboarding and biking. Siskiyou and Cascade mountains converge in Southern Oregon, unique in their breathtaking beauty and biodiversity. Lovers of birds, butterflies, and wildflowers often visit. By Chanticleer B&B Inn. Oregon Shakespeare Festival runs February to October, 3 theaters including an outdoor theater, fantastic productions! By Country Willows Inn. This quaint small town nestled in the S. Oregon mountains is home to the award winning Oregon Shakespeare Festival. Drawing thousands of visitors during the four seasons, bed & breakfasts offer guests concierge service from innkeepers who will guide their guests to the many nearby wineries, rafting on the Rogue River, hiking the Pacific Crest Trail, skiing on Mt. Ashland, and relaxing in beautiful Lithia Park to name a few of the attractions in and around Ashland. Ashland's blend of casual and fine dining is sure to please every palate. Theater goers also have the opportunity to enjoy smaller professional productions at the Oregon Cabaret and Camelot theaters. To escape the summer heat, many head to the mountain lakes east of Ashland for a day of sailing, swimming and kayaking. Unique shops and art galleries draw the many who wander the friendly downtown and railroad districts. Families will welcome the fun times that are guaranteed at the ScienceWorks Museum. By Iris Inn. Ashland is home to the Oregon Shakespeare Festival in its 76 year of providing classic, modern and new plays and musicals. Equity actor and theater at it's best. OSF is the largest regional repertory company in the nation. Ashland also is home to Southern Oregon University with degree and graduate programs covering the arts and liberal arts. By Ashlands Oak Hill B&B. Ashland's Oregon Shakespeare Festival is one of the nation's top regional theatre troupes. Nearby Jacksonville runs the Britt Festival with top musical acts. Great restaurants, art galleries, and shops make Ashland a top-rated tourist destination. Outdoor activities include extensive bike trails, parks, river rafting, fishing, and winter sports at Mt. Ashland. Famous for the Oregon Shakespeare Festival, now re-branded as OSF, the largest regional repertory theatre company in the USA, offers 11 plays performed over a nine month season beginning in February and running through the end of October. As a town of nearly 20,000 residents which swells during the season to accommodate 500,000 people annually, the city has become known for excellent restaurants, a variety of art galleries and river rafting. By Blue Moon B&B. Welcome to Ashland Oregon: Ashland's beauty will first capture you with the unique geographic setting nestled at the base of the convergence of the Siskiyou and Cascade mountain ranges at nearly 2,000 feet in elevation. Home of the Oregon Shakespeare Festival, Ashland offers four distinct, yet reasonably mild seasons with access to many recreational opportunities year-round and amazing culinary offerings. By Abigail's. Home to the 76 year old Oregon Shakespeare Festival. Equity actors at the largest professional repertory company in the US present eleven plays in a nine month season including. classics, modern, new and musicals in three theaters. Ashland is also home to Southern Oregon University with diverse degree and graduate programs in the liberal arts. By Ashlands Oak Hill B&B. Ashland is fortunate to have world class theatre offered by the Oregon Shakespeare Festival. Eleven plays over a nine month season including Shakespeare, classics, new plays, musicals and comedy. Ashland is also home to Southern Oregon University and is close to Crater Lake and many wineries. By Ashlands Oak Hill B&B. Ashland, in the Rogue Valley of southern Oregon is surrounded by mountains, forests and many wineries all with spectacular views. Oregon Shakespeare Festival and the Britt Festivals bring in many west coast visitors who come for world class dining and exciting day trips on the Rogue River and to various attractions throughout the valley. You will love Ashland. By Ashlands Oak Hill B&B.